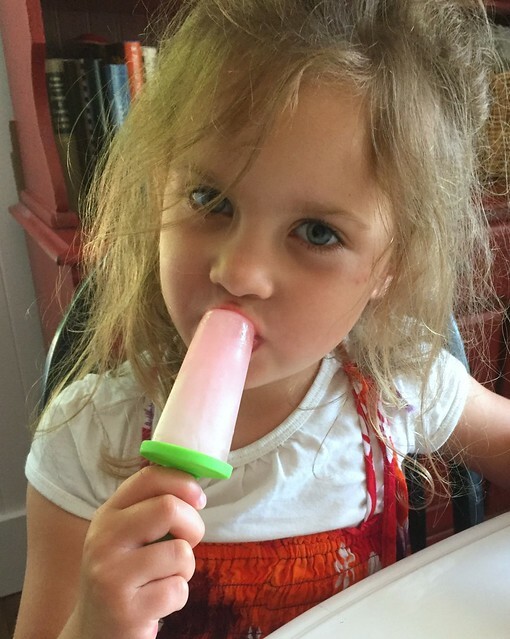 And even though I’m not a health nut, I AM somewhat frugal and can’t see spending so much of my grocery budget on sugary popsicles every single week. 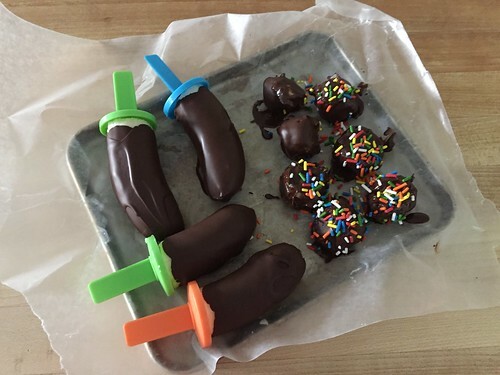 So while we do have some popsicles, ice cream sandwiches, and freeze pops, I also freeze gogurts, we make our own juice and pudding pops, AND I’ve started making chocolate covered banana pops (and bites) — which the kids think are so fantastic. 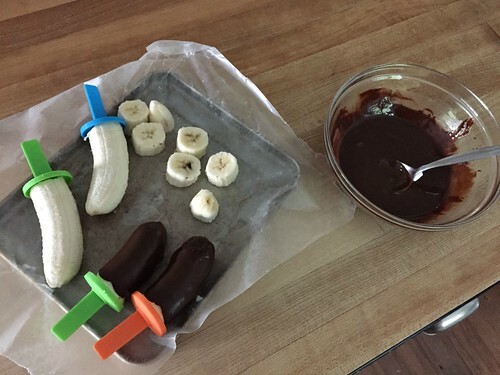 I’m not sure if these popsicles would necessarily qualify as “healthy”, but I figure if they’re eating half a banana with some chocolate and peanut butter, it has to have some nutritional value! Plus, they’re very quick and easy to make, fairly frugal, and an excellent way to use up bananas that are starting to get just a little bit too ripe to eat fresh. 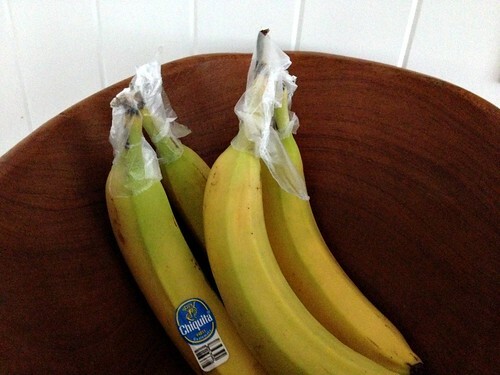 NOTE: Did you know covering the stems with plastic wrap keeps bananas fresh longer? I used to be intimidated by making chocolate-covered anything — I thought it was too time-consuming, too messy, and too much work. 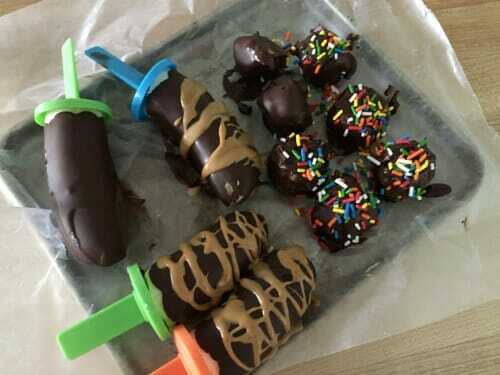 However, I’m glad I gave it another shot this summer because besides getting one bowl and spoon dirty, there really is hardly any clean up, and I can easily whip up a small batch of these chocolate covered banana popsicles in about 10 minute (not including freezing time). If you’re looking for a somewhat nutritious, really delicious summertime treat, give these a try! 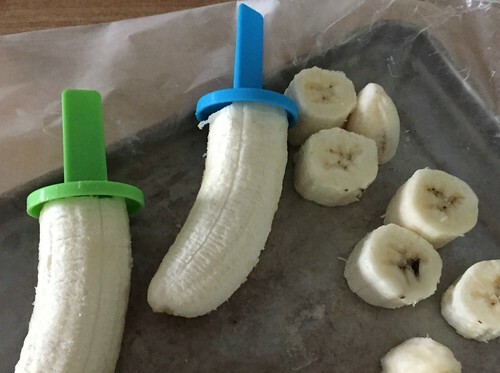 Peel bananas, cut in half, and insert a popsicle stick into one end (or cut into bite-size chunks). Lay on wax paper and freeze for 15-20 minutes. While bananas freeze, melt chocolate and oil in a microwave safe bowl — I do 30-45 second intervals, stirring between. Place the bananas back onto the wax paper and sprinkle with candies, nuts, or drizzle with white chocolate or peanut butter. Freeze again for at least 1 hour. Eat, or put in an airtight container for longer storage. Like I mentioned above, this recipe is so quick and easy, and our whole family LOVES them! 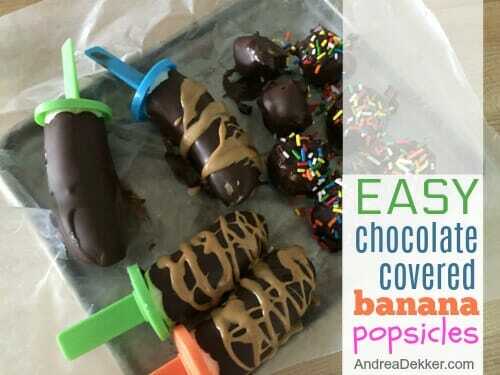 These chocolate covered banana popsicles are such a refreshing treat on a hot summer day! 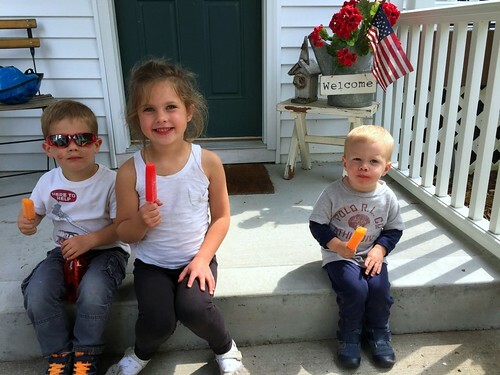 What are your favorite frozen treats for summer? I just made these with my girls and they turned out beautifully. No more buying them in a box!! 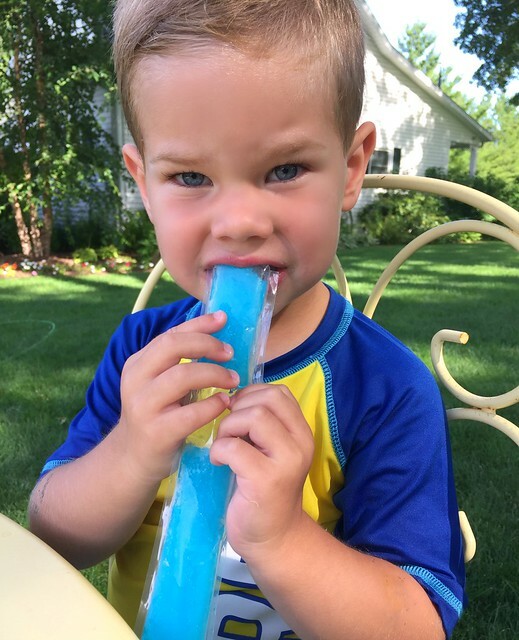 What is the orange mold James is using to hold his ice treat? it’s a popsicle mold, but I have no idea what kind or brand. I got a 4-pack from a thrift store and washed them really good. 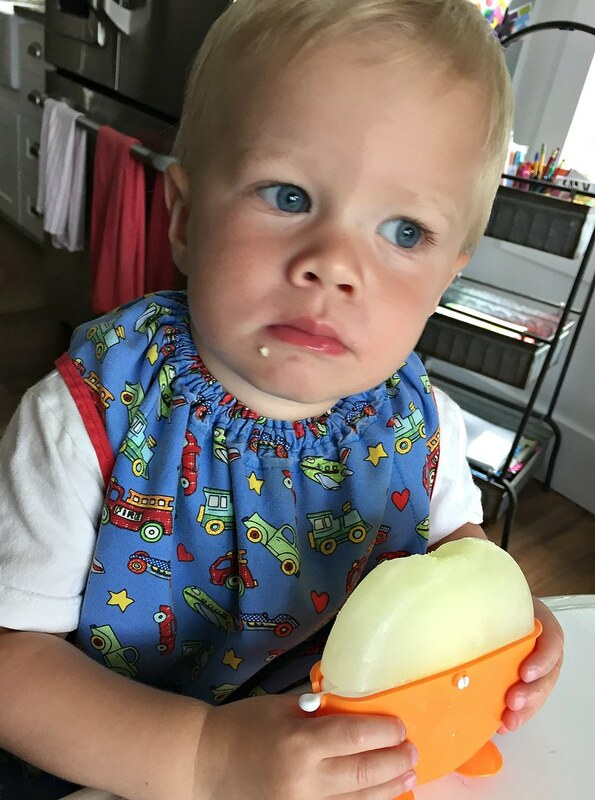 They are SO easy for kids to hold onto and they stand up on a table too! 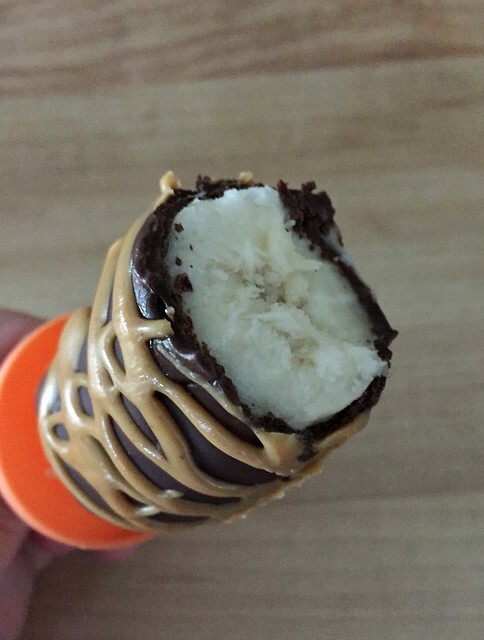 Frozen bananas are by far healthier than frozen sugar water from the store. 🙂 It sounds delicious! These look so good and so dangerous for me at the same time. I LOVE chocolate, I also like bananas but it doesn’t like me. I’ve been making my own chocolate pudding lately, made of avocados. They’re so yummy and good for you too. One recipe serves 3 – 4 people. Mix ingredients together in a blender. Chill and serve. yum… thanks for the recipe! I freeze bananas, and then blended them in my vitamix on “frozen desserts” setting. Tastes and has the consistency of ice cream. yes, I’ve heard of this. We don’t have a blender (crazy, I know) so I’m not sure I could do this yet! How do you drizzle peanut butter over the chocolate…do you microwave it to make it runny? Thanks in advance…. yes, I just put a tiny bit in a small bowl and microwave it for a few seconds (it hardly takes any time at all). Then I drizzle it over the hardened chocolate with a spoon. SO simple! I’ve done something like this before too (actually, I was thinking about making some smoothie pops tonight and surprising the kids for breakfast tomorrow)! !